After rebuilding my turbo, I was disappointed that it made no boost! Turning the Rotating Assembly was rather stiff, so I thought the RA just seized from too little clearance, or I used too much Loctite green. The part is 30+ years old. I used a rather strong t-bolt clamp that caused the tear. The car used to see boost up to 15psi (via a boost controller). 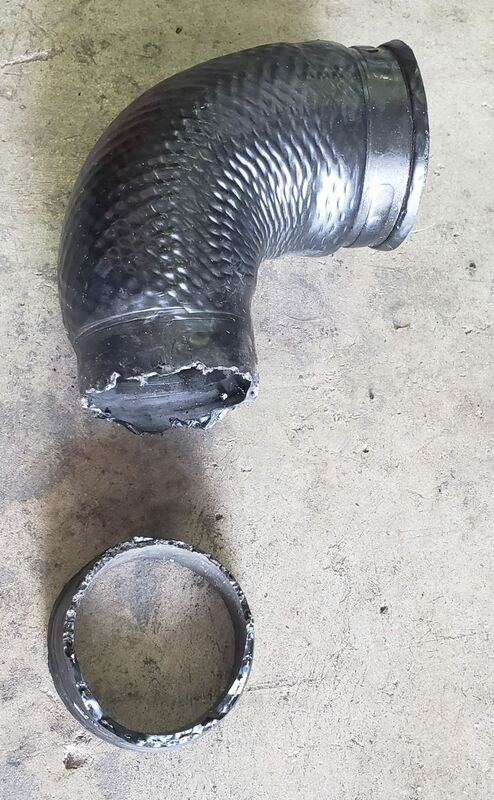 The car regularly sees 10psi of boost for the past several years...until this happened. I've replaced it with an eBay find, silicone unit. Since this is an early Zenki model, I did pick up a 2" to 1.75" 90-degree hose which fit everything fine. Yeah I think Samco still has the cooler hoses mebbe.. I remember doing this with a buddy had the rear pop off... Thought it went pop.